LAGOS, Nigeria (CNN) -- More than 2,500 Nigerians caught in the fighting between Islamic militants and government forces have fled their homes in the northern part of the country, a Red Cross spokeswoman said Wednesday. 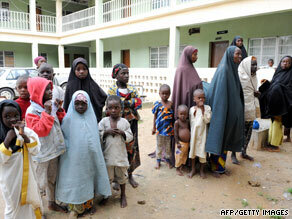 Mothers and their children take refuge this week at a police office in the northern Nigerian city of Maiduguri. More than 400 people have been killed, and 150 bodies were lying in the general hospital at Maiduguri, according to Aliyu Maikanu, a Red Cross disaster officer in the northeast. Most of the violence has been on the outskirts of the city, officials said. "It's a terrible situation for me. It's a very serious battle -- something I have not seen in my life," Maikanu said. She said only security personnel were free to move around due to the risks. Up to 1,000 militants are holed up at their base of operations in Maiduguri, and police have cordoned off the area, she said. National police spokesman Emmanuel Ojukwu said Wednesday that police were able to free 187 women and children whom they claim were being held in the compound of the Islamic militants' leader, Mohammed Yusuf. Under the sect's strict form of sharia law, the group that was released was shielded from public view, Ojukwu said. He said 100 arrests have been made across the north. Shehu Sani, president of the Civil Rights Congress, a human rights organization based in northern Nigeria, said people were seeking refuge in police and military barracks and in hospitals. The militants disagree with the government's teaching of Islam in the region, maintaining that the government allows itself to be influenced by Western values. They have been targeting high-profile government institutions, police and Islamic clergy, Ojukwu said. The operation to defeat the militants is ongoing, he said, and police have been deployed in all northeast and northwestern states. There is a history of religious violence in central Nigeria, where majority-Muslim North Africa meets largely Christian sub-Saharan Africa. Human Rights Watch estimates that more than 1,000 people were killed there in riots in 2001. Last week the human rights organization alleged that police and soldiers killed at least 133 people during two days of riots last year between Muslims and Christians in Nigeria. Most of the victims were young Muslim men, often unarmed, the group said in testimony before a state commission. CNN's Christian Purefoy contributed to this report.